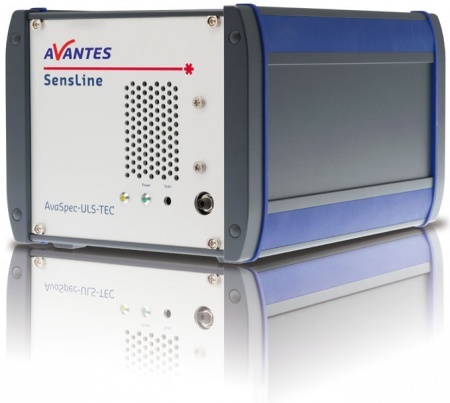 The AvaSpec-ULS3648TEC spectrometer is one of the newest spectrometers in the SensLine. The instrument features our re-designed three-stage Peltier cooling device integrated into our exclusive ultra-low stray-light optical bench, which can reduce the temperature of the CCD chip by -35 °C against ambient, improving the dark baseline and PRNU level by a significant factor. The detector cooling also reduces the dark noise by a factor of 2-3. The size of the ULS3648TEC is reduced by more than 35% compared with Avantes previous TEC spectrometers. The above features make the AvaSpec-ULS3648TEC an excellent choice for low light-level applications, such as fluorescence and Raman measurements, where integration times of more than 5 seconds may be needed. The AvaSpec-ULS3648TEC can be delivered as 1- or 2-channel instrument and has all the standard options, gratings and specifications of the standard AvaSpec-ULS3648. The AvaSpec-ULS3648TEC is built into a newly designed housing with an integrated temperature regulator, USB2 high-speed communication, dual cooling fans and an integrated power supply. For this spectrometer now the Replaceable Slit option is also available! AvaSpec-3648TEC-USB2 Thermo-Electric Cooled Fiber-optic Spectrometer, 75 mm Ultra-Low Stray-light AvaBench, 3648 pixel 3-stage TE-cooled and regulated CCD detector, USB2 high-speed interface, incl. AvaSoft-Basic, USB cable, desktop housing.